A Lossiemouth lighthouse is hoping to welcome in more tourists as plans to create an RAF heritage centre next door take shape. Covesea Skerries Lighthouse is already a visitor attraction, after the local community bought it and the surrounding Keepers Cottages in 2012. Now, having been pledged £250,000 by the Ministry of Defence, the Covesea Lighthouse Community Company Limited (CLCCL) has acquired the land surrounding the building to create a lasting homage to Moray’s armed forces. The group’s director Bernard Annikin unveiled the plans yesterday, and said: “The lighthouse is currently used as an RAF aircraft viewing facility, a purpose it is ideal for. “But the lighthouse itself has limited space and no access for the disabled, so we sought to purchase the land adjacent to it in order to develop the area. “When we have the centre up and running we will ensure it is filled with all manner of RAF memorabilia, and we are looking to install a flight simulator of some sort. “It would be great if visitors could get an experience of flying some of the well-known aircraft in Moray. “But we are only in the early stages at the moment, and there are endless possibilities for different exhibits we could include at the centre. 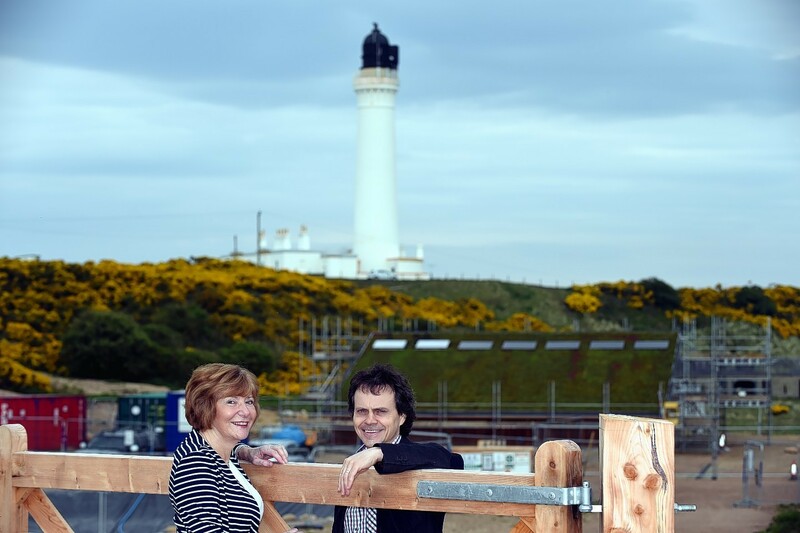 “Our aim is to attract tourists to Lossiemouth with the lighthouse, who will then go on to visit other parts of Moray. The Gordon and Ena Baxter Foundation has agreed to help fund the project and manager Kay Jackson yesterday joined CLCCL at the site to celebrate the purchase of the land. She said: “We were taken with the vision of the community group, it really has long-term plans for this project. “When it came to allocating funding, the plans ticked our boxes on many levels. The Covesea Skerries Lighthouse was built after 16 ships sank during a storm in the Moray Firth in 1826. It was automated in 1984 – nearly a century-and-a-half after the tower was first lit in 1846 and remained in use until March 2012.